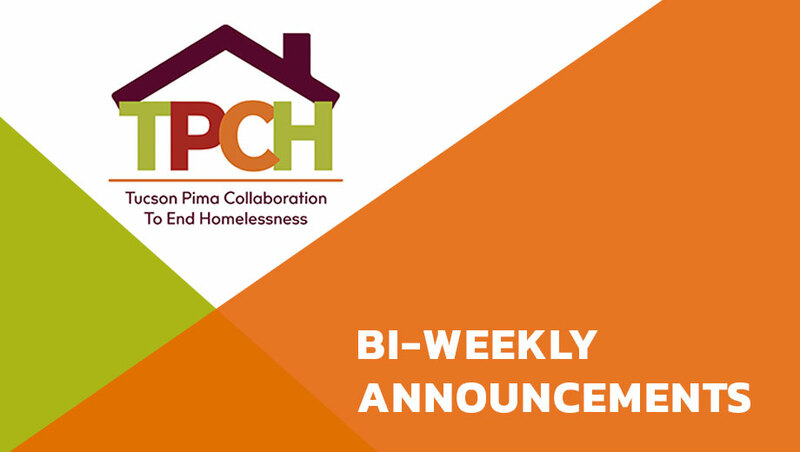 The U.S. Department of Housing and Urban Development (HUD) announced its final FY 2018 Continuum of Care Homeless Assistance Grants on February 6, 2019, including renewed $250,049 in planning funds for TPCH. Click here and then click on the map of Arizona to view awards. The awards for TPCH (the Pima County geographic area) are listed under AZ-501. TPCH received no new or bonus projects. Read how to nominate now! Members of TPCH will elect 2019-2020 committee chairs in April and elect or reelect 2019-2020 Board members in May. Here’s what to do. Committees. Nominate committee chairs and vice chairs at committee meetings in March. Elect the new officers in April for one-year terms to begin July 1; then announce election results at the May 9 General Council Annual Meeting. Board of Directors. Any voting member may nominate a candidate to the Board slate by submitting the candidate’s name to the Treasurer (Linda Kot, lkot@primavera.org) and the Governance & Planning (G&P) Committee chair (Steven Nelson, steve.nelson@pima.gov) by March 31. The G&P Committee recommends the slate to the General Council. TPCH’s voting membership then elect or re-elect directors (if a director is eligible to be re-elected) at the May 9 annual meeting. The 2019-2020 Board elects a Chair, Vice Chair and Treasurer for one-year terms from among all directors at their first meeting (in July). TODAY: Governance & Planning Committee, 8:30-10 am, Sullivan Jackson Employment Center, 400 E. 26th St. Performance Evaluation and Monitoring Committee – Wed., Feb. 13, 9:00-11:00am, Sullivan Jackson Employment Center, 400 E. 26th St.
HMIS Committee – Wed., Feb. 13, 3:00-4:30pm, SAAF, 375 S. Euclid Ave. Coordinated Outreach Subcommittee – Thurs., Feb. 14, 9:30-10:30am, American Red Cross, 2916 E. Broadway Blvd. NEW LOCATION: General Council – Thurs., Feb. 14, 3:00-4:30pm, COPE Training Room, 1485 W. Commerce Court (south of Ajo Way west of I-10). Governance & Planning Committee – Fri., Feb. 15, 8:30-10 am, Sullivan Jackson Employment Center, 400 E. 26th St.
Continuum of Services Committee – Tues., Feb. 19, 8:30-10:00am, Sullivan Jackson Employment Center, 400 E. 26th St. Performance Evaluation & Monitoring Committee – Wed., Feb. 20, 9:00-11:00am, Sullivan Jackson Employment Center, 400 E. 26th St. Coordinated Entry Committee – Thurs., Feb. 21, 1:30-3:00pm, Pettit/Miles Room, Pima County Housing Center, 801 W. Congress St. 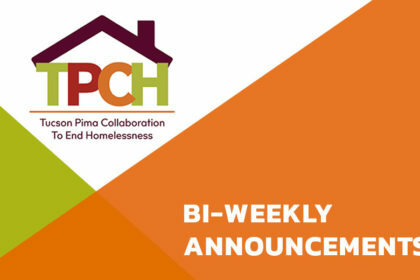 Governance & Planning Committee – Fri., Feb. 22, 8:30-10 am, Sullivan Jackson Employment Center, 400 E. 26th St.
Veterans must provide documentation of homelessness within the past 60 days from a homeless service provider of the Department of Veterans Affairs. See the attached flyer and/or visit https://azhomeless.org. Tucson Veterans Serving Veterans (TVSV) will provide a wide array of services for all veterans – and respite housing at the Grand Luxe Hotel, 1365 Grant Road, Tucson for homeless veterans only –March 13-15, 2019. TVSV also seeks volunteers to assist with Stand Down March 12-15. Please see, post, copy and circulate the attached volunteer, Stand Down, and quarter-page Stand Down flyers. The United Way of Tucson and Southern Arizona provides free tax assistance for people with an annual income of $66,000 or less through Volunteers in Tax Assistance, or VITA. Qualifying persons and families can get help in person, with do-it-yourself software or from Valet Vita, a drop-off and pick-up service. Click here for details.